Los dos sospechosos identificados por el FBI, con mochilas y con gorras (uno blanca y otro oscura). 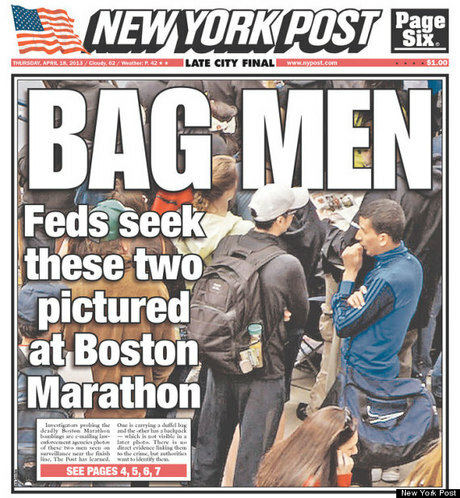 After the Boston Marathon bombing, the FBI enlisted the aid of those attending the marathon through a crowdsourcing initiative to correctly identify two suspects. While the FBI collected hundreds of images and videos, many Internet users used websites such as Reddit or 4Chan to upload their own pictures and begin a parallel investigation. The first initiative was a success, the second a failure. Why? It was a simple and mechanica task: send digital material that might provide information to the FBI through a web form. It didn’t imply any kind of collaboration with other internet users, the crowd just had to upload files to the Internet. 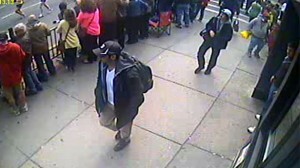 It didn’t imply any value judgment, since the identification and labeling of the photographed as “person of interest” or “suspect” was provided by FBI agents. The task was twofold: a simple task (upload photos to the Internet) and a more complex task that involved a more cognitive and subjective activity (try to identify the culprits). In this case, the crowd was carried away by his fears, prejudices and suspicions. Because the task was done in forums, this gave rise to comments, to the issue of public trials and influencing other people. For the FBI initiative, the medium was clear: a web form where you could upload the material. In this case there was no possibility that would generate noise. In the other case, everything happened in a forum without a clear authority figure who could bring order, so there was no way to separate the noise (opinions) of the signal (what was supposed to be the truth). This had two consequences: the noise grew increasingly (more opinions that generate more confusion) and the signal that finally emerged as valid simply because it had the popular support, not because an objective criteria. When the crowd collaborates and interacts in any kind of collective intelligence initiative, such as crowdsourcing, there must be someone watching and guiding that activity. Using this figure, the medium wouldn’t be a problem. The objective is not to direct the activity or censure it. The objective is to prevent people to be subjective when performing a task that involves some judgment or use of certain criteria by the crowd. In this case, the guilt or innocence of someone in the pictures depended on his clothing or appearance. Thus, “guilt” and “innocence” became two labels that were decided on the basis of entirely circumstantial evidence. One of the most disturbing issues, is that media as NBC or the New York Post gave credibility to these judgments, making this false judgment to come out of the Internet field. The need for a supervisor is not new. One of the best known cases in which people participate, collaborate, comments, etc.. to generate ideas is the IBM Idea Jam. In this particular case, all the participants are divided into smaller groups, which are managed by an employee that supports the group and monitors its operation. When working with thousands of people, each with his own criteria about how to do things or how they should be, you need a really good organization.